July 14, 2004 56.5 inches (144 cm) tall. View of spathe from behind. Today, the Titan is 1 inch taller. It looks like the vertical movement is starting to slow down and the spadix is beginning to really develop some character. The view from behind (pictured above right) shows the spathe just starting to show its color, along with the deep furrows. It appears we are still on schedule for opening on the 18th or 19th. 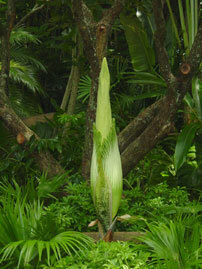 The spathe will redden up quite a bit more and begin to loosen up the day before opening. The opening will be rather dramatic. 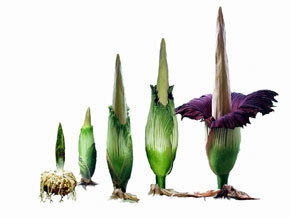 The spathe will open up to reveal its maroon interior in a matter of just a few hours. We hope our guests will be able to see this, although the Titan flowerings at Fairchild tended to open more during the night than during the day. We remain hopeful this will happen before our very eyes. The pollination of "Jack", the Titan currently in bloom in Texas, was done last night and today he released his pollen which was collected and is on its way to Walt Disney World. DID YOU KNOW: The seeds of the Titan Arum are distributed by Hornbills? But they are not the only animals (other than humans) to take an interest in the seeds. The Musang, a fruit eating civet (cat) has been known to partially eat the berries and place them on top of the Titan's fruiting structure (Hetterscheid, 1994). Literature cited: Hetterscheid, W.L.A. 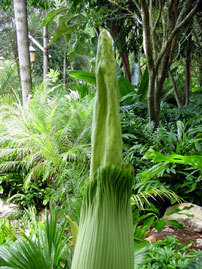 1994 Sumatran Amorphophallus Adventures: 20 August-1 September1993. Aroideana 17:61-77. This page was created by Scott Hyndman for the I.A.S. on July 14, 2004.